Familiarity with the crooked nose leads to appreciation of commonly associated anatomical abnormalities. Asymmetric noses are typically characterized by deviation of the bony upper third and/or the cartilaginous lower two thirds of the nose. Deviation is often sinusoid in nature, shown below, and the tip may or may not be midline. Nasal bones are the most commonly fractured bones in the face, and fractured nasal bones are a leading cause of an asymmetric nose. Neglected or partially reduced nasal fractures usually result in a crooked nose associated with surface depressions and irregularities. These patients often present without prior medical attention, and many recount a history of progressive nasal changes following a traumatic event. Of the patients who do receive treatment following the incident, many find the treatment unsuccessful. Patients with external nasal deformities frequently experience progressive nasal obstruction. Offending trauma leads to both septal deviation and disruption of traditional nasal support mechanisms. With loss of nasal support, internal and external nasal valve collapse may result. Injury leading to a crooked nose may be secondary to a recent event or to years of scarring and contraction following previous trauma. Many people believe they were born with a deviated nose or that the condition was genetic; however, both patients and physicians alike frequently overlook childhood trauma as a common cause of crooked nose. Children are frequent recipients of trauma leading to progressive deviation. The noses of children are composed primarily of cartilage. The nasal bones are smaller, softer, more compliant, and capable of absorbing energy from the force of trauma. Birth trauma may result in nasal septal deviation. Nasal septal deformities are estimated to occur in 1.25-23% of newborns. Forceps-assisted or breech delivery is often mentioned as the etiology of injury, but intrauterine forces may also be responsible for neonatal cartilage deformities. Fortunately, these deviations may be treated easily in the early neonatal period. A displaced septum can often be reduced at the bedside with a blunt forceps. Nasal fractures commonly result from lateral forces. In this type of injury, the nose may appear deviated but is not. This illusion is caused by depression of a unilateral bony fragment. For example, unilateral trauma may in-fracture 1 nasal sidewall, creating the illusion of nasal dorsum deflection to the opposite side. This type of injury carries good prognosis for restoration of function. A truly deviated nasal fracture occurs with greater frontal force and less lateral force. Greater force is needed from frontal impact to produce nasal fracture, as nasal bones are buttressed by frontal process of the maxilla, nasal spine, and perpendicular plate of the ethmoid. Direct frontal injury causes fracture and splays the nasal bones. The septum, which is the shock absorber of the nose, may fracture and be displaced from its pedestal. Nasal trauma associated with septal fracture requires a more extensive repair process. Diseases of the septum and internal nose may cause resorption of supporting structures leading to collapse of nasal valves and deviation. Autoimmune or immunologic diseases are classic examples of disorders resulting in septal injury. Physicians may overlook this category of diseases while formulating a differential diagnosis of asymmetric nose etiology. Connective-tissue diseases play an important role in otolaryngology. Unless a correct diagnosis is made, many symptoms and anatomic abnormalities will recur or progress despite attempts at surgical correction. Other diagnostic considerations include drug abuse and neoplastic processes. Nasal inhalation of cocaine leads to ulceration of nasal mucosa. With consistent use, mucosal atrophy and septal perforation may occur. In cases of neoplastic or polypoid disease, careful inspection of the nose reveals mucosal changes. Nasal bones and cartilage may become lateralized, creating asymmetries in the middle- and upper-third regions of the nose. The nasal surgeon needs to evaluate for these less obvious causes of a deviated nose. Many patients who seek either cosmetic or functional benefits of rhinoplasty are initially pleased with their new appearance. Years later, as the forces of healing begin to manifest, patients may become disappointed. Surgical treatment of an operated nose can be difficult, as landmarks and tissue planes are unclear. The required approach and treatment plan must be strong in fundamental principles of returning nasal support and structure. Evaluation of the twisted nose begins with a thorough history and physical examination. Symptoms of nasal obstruction, rhinitis, or epistaxis may indicate nasal valve collapse or septal deviation. Do not overlook medical or seasonal allergies, because such conditions are necessary components of a complete history. The physical examination encompasses a systematic and thorough evaluation of the nose. Beginning with an external nasal exam, the nose is analyzed in relation to the entire face. Detailed and systematic facial analysis is a time-honored and learned skill that is instrumental in diagnosing structural nasal pathology. Evaluate symmetry and balance of facial aesthetic units separately and in conjunction with nasal structures. Balancing the nose against any asymmetries of the face is important. Skin type and patient age are also important factors that must be considered. Narrow the focus to the nose and determine the nature of the deviation (ie, decide if it is a true deviation or an illusion secondary to a unilateral collapsed upper lateral cartilage). Appreciate involvement of the upper bony third of the nose and/or the middle cartilaginous vault. Detailed attention and analysis of the nasal tip determines if the tip is midline or also deviated. Proper evaluation of the tip is a prerequisite to determining the most appropriate surgical approach. Palpation of the nose for bony irregularities, location of the anterior septal angle, and evaluation of tip support are integral parts of the physical exam. Basal view of the nose may highlight a caudal septum deviation. During inspiration, watch for a collapsing ala, which impedes air entry. This is a sign of external valve collapse and is observed more commonly in individuals who have undergone aggressive reduction rhinoplasty. The crooked nose very often is driven by a deviating or fractured septum. Evaluation of the septal relationship to nasal turbinates is necessary, as compensatory turbinate hypertrophy can contribute to nasal obstruction. The attachment of the upper lateral cartilage to the septum ideally creates an angle of 9-15°. Any angle less than this suggests internal valve compromise. If a positive Cottle maneuver, performed by retracting the cheek skin laterally, conveys relief from obstruction, suspect internal valve collapse. Acoustic rhinometry may objectively define this obstruction but has not been proven necessary in clinical practice. A complete internal nasal examination, repeated with the aid of a topical decongestant, allows better visualization of the posterior and dorsal septum. Constriction of the nasal mucosa improves appreciation of obstructing etiology. Following the history and physical examination, photographic documentation is performed. Photography plays a vital role in preoperative management of the asymmetric nose. It functions as a tool in diagnosis and planning of therapeutic procedures. Photography allows the surgeon to precisely record nasal abnormalities. With the aid of digital cameras and computer-generated imaging systems, surgical alterations may be demonstrated clearly to the patient. Postoperatively, photography serves to document immediate outcome and functions as a historical record to follow surgical changes. Photography may play a role in medicolegal issues. In addition to standard rhinoplasty photographs, other views are helpful in documenting the crooked nose. 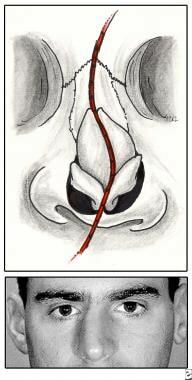 A photographic view from above and behind the nose, as shown below, is a good reference for intraoperative viewing. A straight object, such as a tongue blade, placed down the midline of the nose highlights asymmetries of the twisted nose. Another benefit may be obtained from a single light source, allowing for natural shadows that accentuate nasal deviation. Photo taken from above and behind the subject elucidates crooked nose deformity. Boccieri A. The crooked nose. Acta Otorhinolaryngol Ital. 2013 Jun. 33 (3):163-8. [Medline]. [Full Text]. Potter JK. Correction of the crooked nose. Oral Maxillofac Surg Clin North Am. 2012 Feb. 24(1):95-107. [Medline]. Bloom JD, Immerman SB, Constantinides M. Osteotomies in the crooked nose. Facial Plast Surg. 2011 Oct. 27(5):456-66. [Medline]. Antunes MB, Goldstein SA. Surgical approach to nasal valves and the midvault in patients with a crooked nose. Facial Plast Surg. 2011 Oct. 27(5):422-36. [Medline]. Inanli S, Binnetoglu A. A Combined Approach To Crooked Nose Deformity. Aesthetic Plast Surg. 2016 Mar 2. [Medline]. Gurlek A, Ersoz-Ozturk A, Celik M, Firat C, Aslan S, Aydogan H. Correction of the crooked nose using custom-made high-density porous polyethylene extended spreader grafts. Aesthetic Plast Surg. 2006 Mar-Apr. 30(2):141-9. [Medline]. Watzinger F, Wutzl A, Wanschitz F, Ewers R, Turhani D, Seemann R. Biodegradable polymer membrane used as septal splint. Int J Oral Maxillofac Surg. 2008 May. 37(5):473-7. [Medline]. Anderson JR. Straightening the crooked nose. Trans Am Acad Ophthalmol Otolaryngol. 1972 Jul-Aug. 76(4):938-45. [Medline]. Dayan SH, Shah AR. 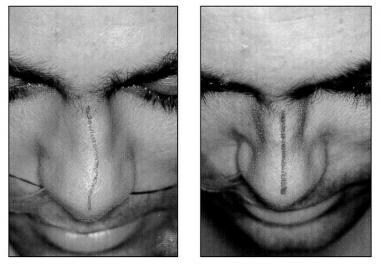 A suture suspension technique for improved repair of a crooked nose deformity. Ear Nose Throat J. 2004 Nov. 83(11):743-4. [Medline]. Dingman RO, Converse JM. The clinical management of facial injuries and fractures of the facial bones. McCarthy JG, Converse JM, eds. Reconstructive Plastic Surgery. 2nd ed. Philadelphia, Pa: WB Saunders; 1977. 599-724. Dingman RO, Natvig P. Surgery of Facial Fractures. Philadelphia, Pa: WB Saunders; 1964. 267-294. Fomon S. The Surgery of Injury and Plastic Repair. Baltimore, Md: The Williams & Wilkins Co; 1939. 614-831. Guyuron B, Behmand RA. Caudal nasal deviation. Plast Reconstr Surg. 2003 Jun. 111(7):2449-57; discussion 2458-9. [Medline]. Kim DW, Toriumi DM. Management of posttraumatic nasal deformities: the crooked nose and the saddle nose. Facial Plast Surg Clin North Am. 2004 Feb. 12(1):111-32. [Medline]. Pontius AT, Leach JL Jr. New techniques for management of the crooked nose. Arch Facial Plast Surg. 2004 Jul-Aug. 6(4):263-6. [Medline]. Shah AR, Constantinides M. Aligning the bony nasal vault in rhinoplasty. Facial Plast Surg. 2006 Feb. 22(1):3-8. [Medline]. The pyramidal frustum serves as a useful geometric model for analyzing the upper one third of the nose. Intermediate osteotomy is completed prior to initiating lateral osteotomy. Osteotomies are necessary to bring the crooked nose back into the midline.